The moment you walk in the door you’ll know you’re at home. Some places can do that. The space in this combined apartment flows beautifully. Truly a gracious layout with tremendous living space that is so hard to find. You enter into a a double sized entry foyer with With a wall of closet space with ample room for all your needs. Just off the entryway is the beautifully renovated - and enormous eat-in-kitchen. Two large windows in the kitchen help to make this room the center of this wonderful home. Two sinks, two dishwashers, two ovens, loads of work and storage space. All of this will have you will entertaining in style. The apartment has huge sunken living room and separate dining room. Wonderful exposures to the South, East and North. Three spacious bedrooms are nicely separated offering privacy and generous space throughout. Two full baths. One is original in exceptionally good condition. The other has been beautifully renovated and must be seen to be appreciated. It’s hard to find apartments this large in Inwood. This property offers a rare opportunity to acquire a home that is truly one of a kind. This special home is located in Park Terrace Gardens, Inwood’s most sought after cooperative. Lovely private gardens, free high-speed internet access, concierge services, live in supers, laundry room and pet friendly are just some of the features of this unique uptown community. Beautiful hardwood oak floors, solid construction and pre-war details. Come and explore Inwood and all it has to offer. Great parks, terrific transportation, convenient shopping, restaurants, Saturday farmer’s market and so much more. Be the latest one to discover all this wonderful neighborhood has to offer. Transportation couldn’t be better. 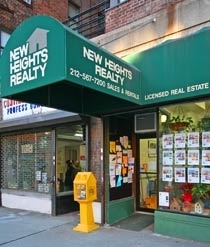 2 subway lines (the A and the #1 trains), express bus and the Metro North train station are all within easy walking distance. Please note that several light fixtures are not included in the sale. See broker for complete list.